Here is the cast list and first rehearsal information for Disney's Beauty and the Beast at the Playhouse! More information will be sent by email or phone soon! There were so many wonderful people that came to audition! Thank you all for coming out. For those who were not chosen for this show, please, please continue to audition for the shows at the Playhouse! "Beauty and the Beast" auditions will be held the 11th & 12th of April at the Maciolek School of Dance at 7pm. Singing and cold reading auditions will be held on the 11th with some possible singing and readings also on the 12th. For more information on how to prepare and what to look forward to click here. 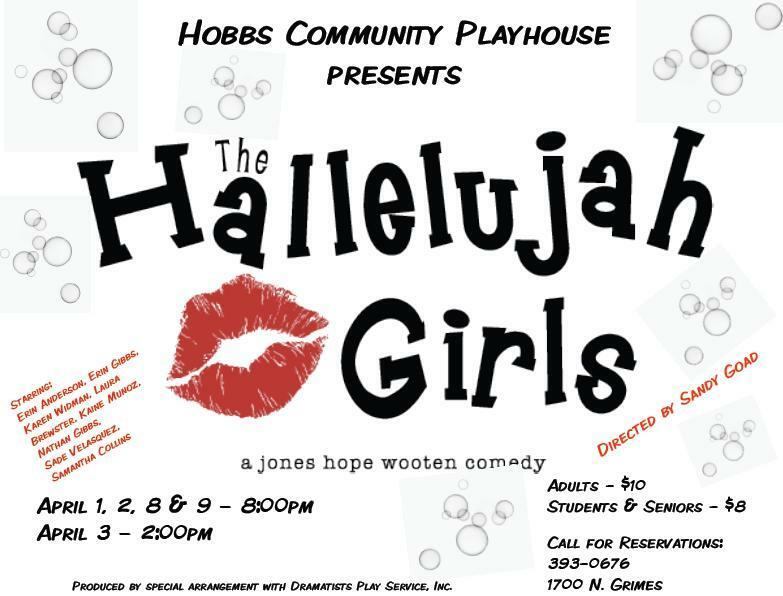 You have 2 more chances to see this hysterical comedy. Directed by Sandy Goad and starring: Erin Anderson, Erin Gibbs, Karen Widman, Laura Brewster, Kaine Munoz, Nathan Gibbs, Sade Velasquez, and Samantha Collins. Final performances are: April 8 and 9 at 8pm. HALLELUJAH GIRLS! 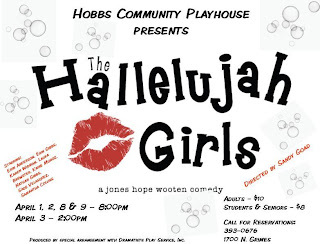 opens tonight at 8 p.m. Other performances are 8 p.m. Saturday and a 2 p.m. Sunday. Then the following weekend at 8 p.m. Friday and and Saturday, April 8 and 9. This comedy is directed by Sandy Goad and features Erin Anderson, Laura Brewster, Karen Widman, Erin Gibbs, Nathan Gibbs, Kaine Munoz, Samantha Collins and Sade Valesquez. Hilarity abounds when these fun feisty females of Edan Falls, Georgia, gather it open the Spa-Dee-Da. Make your reservations today by calling 393-0676. 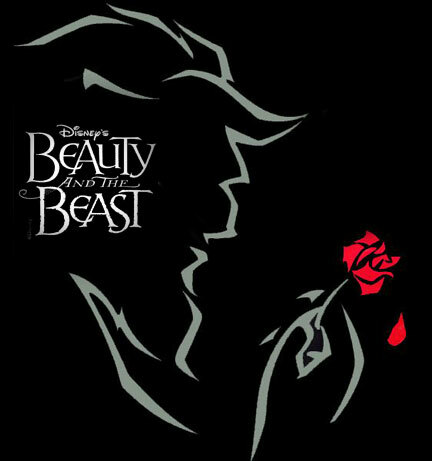 BEAUTY AND THE BEAST auditions are April 11 and 12 at the Maciolek School of Dance at 7 p.m. Singing and cold reading auditions will be held on the 11th with some possible singing and readings also on the 12th. You need to prepare a short song (16-32 measures of music will suffice). Bring sheet music in the appropriate key or a CD track of your song. The 12th will mostly be a dancing and movement audition (dress to move). There are some possible non-singing acting roles and non-singing dancers. A current resume and headshot are recommended. Casting all ages! There is the specific need of a child actor/singer for the role of Chip, Mrs. Potts' son. There are some possible non-singing acting roles and non-singing dancers. Casting all ages! This is the Disney Broadway musical, which is based on the movie. The show dates are June 2, 3, 4, 5 and June 9, 10, 11 and 12 . It is directed by Juston and Larry Harlin. Karen Salb of Maciolek will be directing the dance. ZOO STORY: "The Zoo Story" cast competed in Artesia and nabbed the alternate spot. This means if either of the other two shows picked to advance to regionals cannot make it, then "The Zoo Story" will be able to go. Congrats to "The Zoo Story" cast and those who did monologues at the state level competition. Find us on Facebook, MySpace, and Twitter. 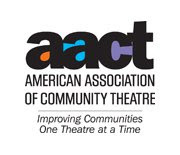 Remember, the Playhouse has 74 years of history and the "community" in community theater means everyone, including you!